Vicneshri is an Associate with Lexcompass LLC. She graduated from the University of Nottingham in 2015 and did her Practice Training in Virginia Quek Lalita & Partners. She was admitted to the Singapore bar in 2017. Her focus is on Family Law and Civil Claims. 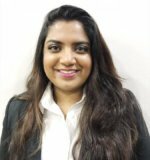 Vicneshri believes in listening to her clients and understanding their situation and worries as well as safeguarding their rights and interests. She understands that all legal matters are stressful for her clients and will provide them with guidance in making the best decisions for themselves in difficult situations. Vicneshri is fluent in English and Tamil. Vicnaysen is a helpful and reliable lawyer who understands her clients’ needs regarding legal advice and has very clear direction in helping them find the best solutions. She enlightened me when I had enquiries and made the entire legal process hassle-free by executing it with efficiency and rationality. A very reliable and efficient lawyer.Thannk you very much. At the start, I was very worried about my legal issues and the payments as I had bad experiences with lawyers who did not return calls or contact me with regards to the process.. However, for Vicky, after every call, she will follow up with an email about the items discussed in the call. When I contacted Vicky, she listened to my legal needs patiently and she assured me very confidently that my legal woes could be fixed. She was also very clear in explaining the payment and the prices. She was truly a very helpful lawyer who went out of the way to help. She discussed every step of the procedure very carefully before proceeding. I think in times of difficulties, people who are uneducated about the law is especially vulnerable and worried about legal costs and the lengthy process. Vicky is a very honest and helpful lawyer. I am grateful for the help she has rendered. I was happy when Vicneshri called me promptly upon receiving my email. She was friendly, helpful and patient with my queries. In fact she gave me her suggestions too on what I should do. I was comfortable and pleased with her service and would highly recommend her.